Parapsychologist Elise Rainier returns to her childhood home to confront a demon unleashed as a child. People who need help with haunted matters that can’t be easily or logically explained seek advice from brilliant parapsychologist, Dr. Elise Rainier. The doctor is now able to personally admit that strange presences can be terrifying, as she’s finally ready to face her most frightening and intimate haunting yet, which is plaguing her old family home. Elise’s reconciliation with her past is the powerful motivator in the supernatural horror film Insidious: The Last Key. The mystery thriller was directed by series newcomer Adam Robitel, and penned and produced by franchise scribe and actor Leigh Whannell. Insidious: The Last Key delves into the troubled upbringing of Elise (Lin Shaye as an adult, and Ava Kolker as a child), a brilliant psychic, clairvoyant and demonologist who has spent her life guiding innocents back into the light, and thwarting creatures that have opened unholy doors into eternal darkness. Growing up in New Mexico in the 1950s and ’60s with a loving mother, Audrey (Tessa Ferrer), who supported her psychic abilities, and a distant and critical father, Gerald (Josh Stewart), who strongly opposed her talents, Elise had to learn how to control her communications with the dead. But in the process, she accidentally unleashed something unspeakable into her world, which further strained her relationship with her father and younger brother Christian (Pierce Pope as a child, and Bruce Davison as an adult). In 2010, Elise is contacted by the current owner of her childhood home, Ted Garza (Kirk Acevedo), who’s experiencing his own troubles with the supernatural in the most haunted house the psychic has ever entered. Along with the help of her new colleagues, Specs (Whannell) and Tucker (Angus Sampson), Elise decides to travel back to New Mexico. 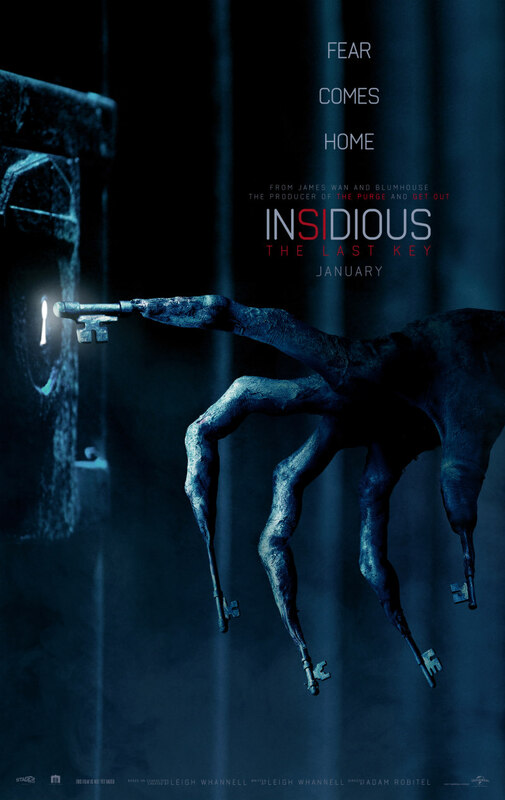 In the process, she must face her greatest fears, and destroy the immortal Key Face (Javier Botet), the demon she unwittingly set free as a young girl, when she was trying to escape the wrath of her father. She’s determined to vanquish him on his terrain, so that she can not only permanently free the souls he’s been imprisoning, but also finally reconcile with Christian. The second prequel, whose events are largely set in the aftermath of 2015’s Insidious: Chapter 3, is one of the most emotionally and visually intense and meaningful entries in the tantalising series. Whannell, who wrote and starred in all four installments of the supernatural series, grippingly and powerfully connects The Last Key to Chapter 3, as well as to the hit 2011 original film. Not only does the story of the new movie satisfyingly further explain the growing working and personal relationships between Elise, Specs and Tucker established in the previous prequel, but also powerfully discloses how the trio decided to help the Lambert family in the first film. With the history of the Lambert family being explained in the first two movies, including 2013’s Insidious: Chapter 2, it’s gratifying to finally witness the origin story for Elise, once again memorably played by Shaye, who perfectly balances the sentimental and light-hearted nature of her character. The Last Key, which grippingly utilises the signature dramatic and supernatural elements of the franchise, also naturally eases the tension with amusing humour and banter between the cast, particularly Shaye, Whannell and Sampson. Not only is the emotional arc of Elise embracing, and reconciling with, the psychic world from the time she was a child, and how it affects the relationships with the people in her life, a captivating driving force in The Last Key, so is the visual presentation of her provocative world. The drama’s production design by Melanie Jones, as well as its art direction by Hunter Brown, helps foster an emotionally and physically menacing childhood home that doesn’t appear to have changed since Elise’s youth. Along with the stunningly unique make-up and costume design of Key Face and his fellow demons that Elise determinedly fights in order to finally defeat him, the fourth entry maintains the integrity of the Insidious series’ stunning emotional arc and chilling visuals. 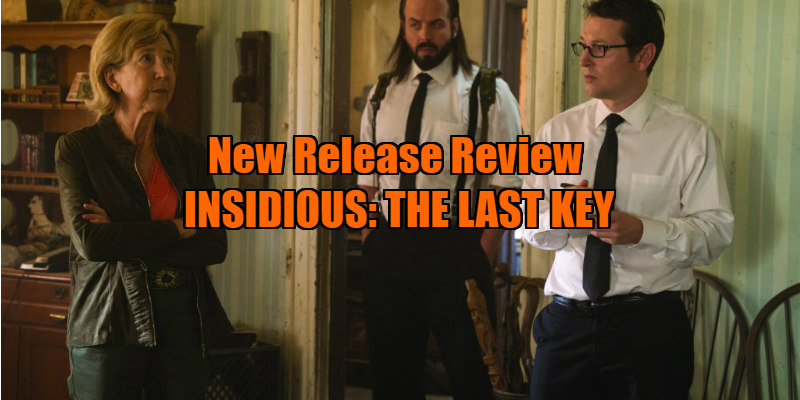 Insidious: The Last Key is a must-see installment in the series that compellingly brings all of the elements of the entire franchise together. The second prequel will undoubtedly satisfy the curiosity of the series’ fans, who are eager to better understand the motivations and backstory of Elise, who’s one of the most prolific protagonists in the horror film genre. Along with the heroine’s amusing humour and banter and equally heartfelt emotional connection with her devoted assistants, and the striking make-up and costume design of Key Face and his fellow demons, the fourth entry is a noteworthy conclusion to one of the best protagonist arcs in a horror series of the modern era. Despite the satisfying closure of Elise’s story in Insidious: The Last Key, fans will surely wish to see another appearance by the beloved Shaye in a future installment of the classic franchise. Insidious: The Last Key is in UK/ROI cinemas January 12th.